At the Competitiveness Council at the end of May, Germany and the Netherlands made their Joint Position Paper on the European Open Science Cloud (EOSC) public and presented their approach to boosting the EOSC through the GO FAIR initiative. Dieser Blog-Post ist nur in englischer Sprache verfügbar. According to a recent article in The Economist, the world’s most valuable resource is no longer oil, but data. Today Europe is the largest worldwide producer of scientific data, but an insufficient and fragmented infrastructure means that data is not being exploited to its full potential. Against this backdrop, Germany and the Netherlands see the need for a fast track implementation initiative to boost the further development of the EOSC. The primary focus is to involve all networked initiatives, research disciplines and interested Member States to make research data findable, accessible, interoperable and re-usable (FAIR). “Time for action is now”, say State Secretaries Georg Schütte (Germany) and Sander Dekker (the Netherlands) in their Joint Position Paper and propose to support the GO FAIR initiative, as a promising approach towards establishing the EOSC. GO FAIR is completely open-to-all and can contribute to a broad involvement of the European science community as a whole. They called on the other Member States to join the movement and urged the European Commission to strengthen its efforts through proposing appropriate governance and funding frameworks for the realisation of the EOSC. Finally, they called on the research and e-infrastructure communities throughout Europe to join GO FAIR and participate in shaping its future. 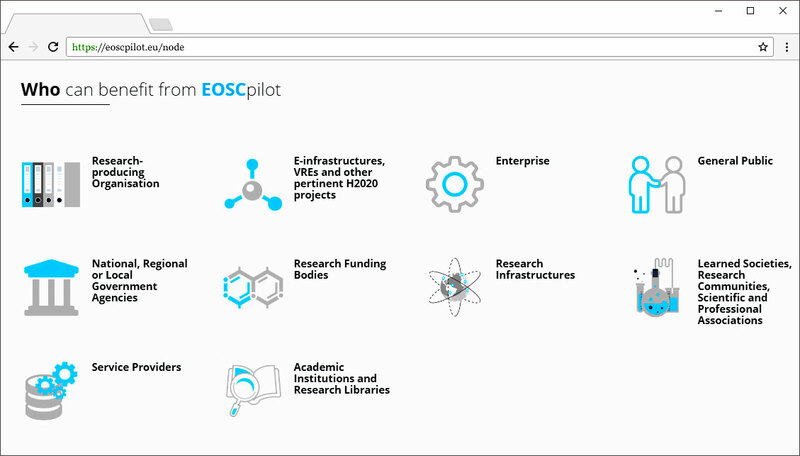 Since January 2017 the first EOSCpilot project gathers a consortium of 33 pan-European organisations and 15 third parties covering a range of disciplines and organisations working together to develop a European-wide governance framework for the EOSC and to contribute to the development of European open science policy and best practice. Such EOSCpilot measures and GO FAIR have a joint goal but focus on different aspects, phases, and timing of the cloud. The EOSCpilot measures will contribute to establishing the overall governance framework for the EOSC, whereas GO FAIR will focus on early implementation needs of existing networks and consortia. (iii) setting up and promoting a programme of (cultural) change with relevant stakeholders, to value curated data as important research results. Having more than one initiative on the way to the EOSC will help to keep the issue on the agenda. With the EOSCpilot at hand, the European Commission and the Member States might have waited for the first results in some years. But with the GO FAIR initiative, all Member States have the possibility to join the community of early movers instead of waiting only to react to the results of the EOSCpilot consortium. This will help to streamline the different national initiatives such as the German National Research Data Infrastructure (NFDI) or the Dutch National Open Science Platform accordingly to EOSC needs. With a well-balanced division of labour between EOSCpilot and GO FAIR the road to the EOSC could be optimized and help to reduce potential misfits. Assisting implementation networks to align themselves with the GO FAIR Rules of Engagement and to prepare them to join the GO FAIR initiative. Supporting the implementation and further development of GO FAIR e.g. by organising GO FAIR events such as workshops and meetings of the governing board. Fostering compliance with the self-prescribed Rules of Engagement by supporting the establishment and implementation of a monitoring mechanism for the GO FAIR implementation networks. Authors: Dr. Willi Scholz, Prof. Klaus Tochtermann (ZBW – Leibniz-Informationszentrum Wirtschaft).